Another busy day in the office with Everything Dinosaur today. Lots of new products to sort out and our team members are working hard to ensure we stay on top of the orders so that they can be despatched promptly after the holidays. However, we did make the time to create a new banner for the Everything Dinosaur homepage, so that we could wish all our website visitors a Happy Easter. The rather soft and cuddly Tyrannosaurus rex about to eat the Easter egg is the one from the “DIY Dinosaur” craft kit that the company recently added to its product range after field testing. In the next few days or so we have to add another ten products, this will keep our IT team busy. We then have the reviews to write up and sort out onto our social media pages – all in a day’s work for us at Everything Dinosaur, how “eggciting”! Still it keeps us out of mischief and we do have a lot of paperwork and other things to catch up with and ther are sponge cakes and cream cakes available to keep us going. With the long weekend due to the Easter Bank Holidays and the strike by more than 2,000 postal workers in the UK, there can be delays and other difficulties expected in the country’s mail handling systems for the next few days. However, team members at Everything Dinosaur are doing all they can to minimise any potential disruption to the delivery of their customer’s parcels. Following a ballot, members of the Communication Workers Union (CWU) have gone on strike at 370 crown Post Offices in the UK, this morning. The staff are in dispute with management over proposed changes to the branch network, branch closures, pay and conditions. This industrial action is likely to cause widespread disruption and delays in the processing and handling of parcels and other mail items. The strike also coincides with two Bank Holidays when no mail deliveries or collections are made, so a back log of unprocessed mail is very likely to build up. In addition, new pricing tariffs being introduced by Royal Mail on Tuesday April 2nd will potentially cause further difficulties as staff adjust to the new prices and handling of parcels policy. In response, to these potential problems team members at Everything Dinosaur have volunteered to work throughout the Bank Holiday weekend. Staff came into the office on Friday (Good Friday) and made sure that any orders placed Thursday evening, Friday and early Saturday morning were packed and despatched and received into the postal network by 10am Saturday 30th April. This action by Everything Dinosaur team members permitted all parcels to be collected Saturday morning by Royal Mail, it will hopefully help to minimise any delays in delivery. Staff at Everything Dinosaur will also ensure that any orders placed before 12 noon on the Saturday are packed and despatched and placed in the hands of the Post Office. Team members are on stand by to drop off parcels in person, this too will help to minimise any delays. Unfortunately, the industrial action also coincides with it being the last day of the month over the weekend, Post Offices are likely to be busier than usual as motorists come in to get new tax discs. Everything Dinosaur is currently exploring a number of other delivery services and contingency plans have been put in place to ensure that parcels can still be sent out using other couriers, it is our intention to operate alternative parcel handling services and some of these will be in place from Tuesday April 2nd onwards. However, due to circumstances largely out of Everything Dinosaur’s control, there may be some delays to orders that have been requested to be sent by First Class, Second Class and other Royal Mail delivery services. An ideal gift for a young dinosaur fan that combines a fascination for all things dinosaur with a practical craft kit. This make your own dinosaur kit has proved popular both with young children and with their parents and guardians. Each kit contains all that is required to make a felt, dinosaur soft toy. The box contains felt shapes already cut to shape, stuffing material, glue, wiggly eyes, thread and a needle for the sewing. The instructions are written in plain English and they are a little light on detail but there are some handy diagrams to assist budding young crafters. A "DIY Dinosaur" Craft Kit. There are two different dinosaurs in the series, each kit is supplied with the materials to make one dinosaur. There is a purple Stegosaurus complete with yellow felt spots and armour plates made from diamond-shaped felt pieces that have already been cut out for you. The second dinosaur in the kit series is the carnivorous Tyrannosaurus rex. The felt pieces in our kit were light green in colour, with some blue pieces to make the underside of the soft toy. The set even included a series of pink felt spots that could be glued onto the flank of the T. rex, so that a pink, spotted “Tyrant Lizard King” could be made. The teeth of this meat-eating dinosaur were made from pieces of white coloured felt that had already been pre-cut. They were a little difficult to sew into the mouth, but a dab of glue to secure them first did the trick. A colourful and easy to make Stegosaurus soft toy. The stuffing material provided was just enough to fill out the animal, however, if young dinosaur fans are concerned about this at all, cotton wool can be used to help “plump up” your dinosaur if required. The first thing to do is to check that you have all the contents of the kit, they are supplied in clear plastic bags so that the contents can easily be checked. Watch out for the sewing needle, the point of the needle was held securely by a small, bright yellow block of foam in our kits. This would prevent anyone from pricking their finger as the kit was opened. Once you are ready to start, the first job is to sew the body pieces together. If the young dinosaur fan is not that good at sewing the pieces they can always be glued first before stitching together. Sew the underside to the rest of the body, but leave a gap for the pink or red mouth piece, as it is through the mouth that you push the stuffing material to fill out your dinosaur. Once the mouth has been sewn in place, it is then a question of sewing together the limbs, the front limbs of the T. rex proved to be the most fiddly, this is because they were much smaller than the back legs. Don’t forget to stuff the limbs with the soft, stuffing material and then when this stuffing job has been completed, the limbs can be sewn onto the body. A dab of glue can help to secure the legs and arms in place before sewing commences. It is also a good idea to spend a little time working out where on the body the legs will go, a bit of care at this stage will help you create a more aesthetically pleasing end result. A DIY "Tyrant Lizard King". Once the legs are finished, it is just a question of decorating your dinosaur. With the Tyrannosaurus rex, as mentioned earlier, the set contained some pink felt dots that could be glued onto the body to make a spotted dinosaur. The Stegosaurus kit comes with some yellow pre-cut felt shapes so that you can decorate your soft toy and add the row of spikes at the end of the tail. The last thing to do is to glue the wiggly eyes in place (we call them “goggle eyes”) and you have made your very own soft toy dinosaur. This kit is suitable for children aged six years and upwards, although an adult with some craft and sewing skills on hand to assist where necessary would be very helpful. It was difficult to make the bipedal T. rex stand upright but that did not seem to detract from the sense of achievement for having made a “prehistoric animal”. A simple and fun to make dinosaur kit, with the added benefit of having everything you need to make your dinosaur contained in the box. Ideal for young dinosaur fans from six years or older and a great hobby or craft idea. After all, you can resist making their own “DIY dinosaur”. There has been much discussion in recent weeks regarding the extraterrestrial impact that occurred approximately 66 million years ago, a probable causal factor in the demise of the dinosaurs, their ultimate extinction and the loss of something like seventy-five percent of all land based organisms. A new study by a team of scientists based at Colorado University – Boulder has concluded that one of the immediate consequences of the impact of an object from outer space on planet Earth, was a global fire-storm. Fires would have devastated all the terrestrial vegetation, the smoke and ash from such an immense conflagration would have contributed to a contamination of the Earth’s atmosphere and probably blocked out the sun’s light for a very long period. Any plants that were not burnt to a crisp, or any seeds that germinated after the initial fires would have had very little light with which to photosynthesis. The collapse of the land-based food chains would have followed, once there were no plants, the plant-eaters including herbivorous dinosaurs were doomed. After a brief period of bounty where the surviving predators could feast on the carcasses of the dead, the meat-eaters too would all be ultimately doomed. Such an apocalyptic picture is presented by researchers from the Co-operative Institute for Research in Environmental Sciences (CIRES) who used sophisticated computer modelling techniques to synthesise the amount of debris that would have been ejected into the atmosphere after the extraterrestrial impact. Scientists remain uncertain as to what exactly collided with the Earth and led to the extinction of the dinosaurs. In a recent paper, published by a team of researchers from New Hampshire (United States), it was suggested that the actual object that smacked into the Yucatan peninsula of Mexico was a comet and not an asteroid/meteor at all. Douglas Robertson (CIRES), and his co-authors propose that the ejected material that would have been blown up into and almost beyond the atmosphere by the impact blast would have been heated in the upper atmosphere as it re-entered. The skies would have glowed red for many hours after the impact at temperatures possibly exceeding 2,700 degrees Fahrenheit – cooking any organism that was not able to seek shelter underground. Vegetation would have spontaneously combusted and a global fire-storm resulted. One of the drawbacks proposed previously for the extensive forest fires theory was the lack of charcoal to be found at the famous K-T boundary, the geological feature that marks the end of the Cretaceous and the beginning of the Palaeogene. If there had been such a fiery inferno created, the vegetation consumed by the flames would have left extensive geological deposits of ash and charcoal. The Colorado University team corrected their data to take into account changing sedimentation rates and when the charcoal data from the K-T boundary was adjusted to take into account these same changing sedimentation rates, the figures showed an excess of charcoal not a deficiency. In essence, this new assessment of the charcoal evidence, sometimes referred to as the “smoking gun” in relation to forest fires, supports the theory of a global fire-storm rather than detracting from it. The end of the Age of Dinosaurs. Studies of the 170 kilometre wide Chicxulub crater on the Yucatan peninsula of Mexico have led the majority of scientists to believe that this global catastrophe had an enormous impact on the fauna and flora around at the time. Along with the dinosaurs, marine reptiles, flying reptiles, ammonites, as well as many types of marine plankton, brachiopods, bivalves and sea-urchins became extinct. In terms of plant life, the angiosperms (flowering plants) as a group suffered also but most of the species affected and ultimately caused to become extinct were associated with land masses to be found in the northern hemisphere. Recently, an analysis of the geophysical evidence at the Yucatan site enabled scientists to come up with the most accurate date yet for the extraterrestrial impact. A team of international researchers, including scientists from Holland, the United States and Great Britain established the date of the impact event to be around 66,038,000 years ago, plus or minus 11,000 years for a margin of error. Immediately following the impact, the explosion would have sent up millions of tonnes of vaporised rock. This would then have condensed into sand-grain-sized spheres as they rose up into the upper atmosphere. As the ejected material began to fall back down to Earth under the influence of gravity, enough heat energy was retained in the atmosphere to create an infrared “heat pulse”, so hot that the sky would have glowed red for many hours, not that there was much alive bigger than a small dog on the land to see it. Part of the radiated heat energy would have been blocked, firstly by the falling material in the atmosphere and secondly from the ash and smoke that would have been ascending from the fires. Even with some of the “heat pulse” effectively being blocked out and not reaching the surface of the Earth, there was enough heat energy getting to ground level to cause dry materials such as leaves and pine needles to explode into flames. The American team then set out to calculate just how much energy would have been generated by the infrared radiation. They calculate that the total amount of infrared heat was equal to a one megaton hydrogen bomb exploding every four miles over the entire surface of the planet. A one megaton hydrogen bomb has the explosive power of about eighty Hiroshima-type nuclear devices. The scientists postulated that the extraterrestrial impact generated about one hundred million megatons of energy. The layer of soot, which can be found at the K-T boundary (the geological feature that marks the end of the Cretaceous), is thought by some scientists, to be evidence of the actual impact. However, this new research paper suggests that the sooty layer is too deep to have been created solely by the impact event. The thickness of the sooty layer, according to the researchers, is consistent with great fires that would have engulfed much of the Earth in the aftermath of the collision. With the first three months of 2013 having whizzed by, we thought it would be appropriate just to re-cap on progress made on some of the social media activities of Everything Dinosaur. At the beginning of the year, we set out a number of predictions as to what we thought was going to happen over the next twelve months or so. As well as trying to predict news stories that we would feature and fossil discoveries, our team members set out some targets for themselves to see how things develop in Everything Dinosaur’s social media environs. All to be completed by the end of this year, so how are we doing? Well, to date we have something like 515 Ezine articles published with another 3 awaiting review prior to publication. The articles are mainly in the science categories, reporting on developments in palaeontology and new fossil finds. However, there are lots of product reviews, features on dinosaur models and helpful teaching and craft tips with a dinosaur theme. So far so good, we are on target. Everything Dinosaur continues to publish lots of pictures, links, illustrations and other material on the company’s Facebook page. We are always keen to hear from our customers, we respond to every question and reply to messages, we even publish some of the pictures sent into us by very young dinosaur fans. We are delighted to hear from fellow fossil collectors, teachers and all round dinosaur enthusiasts, we really appreciate your input. It took a lot of hard work but we were able to achieve our target of writing 365 articles in exactly 365 days. This challenge was set back on February 25th 2012 and we actually had our 365th article published within the challenge period about four weeks before the challenge expired. So far this year, we have researched, written and had published over eighty articles as we press on towards our target of 650. We have put up over fifty videos to date, most of them reviews of new model releases and we are well on track to exceed 300,000 video views in 2013. In fact, according to some members of our IT team we may well reach the 300K mark in the next six weeks or so. Perhaps a target of half a million by the year end should be set. Once again we read every comment, message and response on our Youtube site and we reply to all those that require one. We love sharing dinosaur and other prehistoric animal information and ideas. We joined Pinterest a couple of months ago, we have really enjoyed seeing and re-pinning all the amazing fossil pictures and dinosaur themed illustrations on Pinterest. Here too, we have started to pin up more examples from our customers, we are grateful for all the correspondence that we receive we do read them all. To date, we have pinned up something like 700 pictures and images. We are well on course to complete 1,000 pins and we will probably be nearer 2,000 pins by the end of the year. We appreciate all the “shares”, “follows”,”tags” “likes” and so on, we do our best to reply promptly to all who contact us. Click to visit Everything Dinosaur's Pinterest pages. So far so good, but we will continue to remain as dedicated to our customers as we always have been and we look forward to hearing from you in the future. Let’s see how close or how far over the targets the team members at Everything Dinosaur achieve by the end of the year. As well as producing a range of prehistoric animals, the manufacturer known as Collecta have added a number of models of prehistoric plants to their model range. One of the biggest prehistoric trees that the company makes is the thirty centimetre tall replica of a Cycad. Cycads are a group of plants that many palaeobotanists (scientists who specialise in studying ancient plant life), believe first evolved in the Permian geological period. Indeed, the first proto-cycads may have had their origins in the swampy environments of Carboniferous forests. The paucity of the plant fossil record makes determining the exact age of this group extremely difficult. Scientists remain unsure of how the Cycad group may be phylogenetically related to other primitive and now extinct groups of plants such as the Pteridosperms and the Bennettitales. Cycads were abundant during the Mesozoic and they have survived to the present day although there are three extant families still represented today. These plants can be found in the Americas, Central and Southern Africa, Asia and Australia. Their fragmented distribution today indicates that the modern species are the remnants of a plant group which was once very widespread. The geographical distribution of the Cycad-type plants has been used in the past to support the theory of continental drift. Adding authenticity to dinosaur scenes. The Collecta Cycad prehistoric tree model, stands approximately thirty centimetres tall. It is supplied as 5 piece model that simply slots together. The trunk supports several rosettes of fern-like leaves and these are simply slotted together to form this impressive prehistoric tree replica. The tree is well painted and the trunk in particular shows lots of detail. The model is supplied with a small base (it forms a single piece with the trunk), this base is painted a sandy brown/grey colour and it is very unobtrusive. Extant Cycads generally tend to be relatively squat with whorls of evergreen fronds cascading out of the crown. However, the Cycads of the Mesozoic varied considerably and some of these ancient genera formed extensive tree cover with individual specimens growing to more than ten metres high. The Collecta 12″ high Cycad tree works well with 1:40 scale prehistoric animal replicas. It can also be used with smaller not-to-scale dinosaur models, the replica tree in this case would simply represent a larger Cycad specimen. A welcome addition to the Collecta model range. At the central point on the highest rosette of fern-like leaves, a number of bright orange objects can be seen. These are cones and possibly indicate that the model represents a male Cycad. Plants are either male or female, the male plants producing pollen from specialised cone-like structures. In many modern species of Cycad, the male cones are bright orange, the design team at Collecta have clearly been influenced by this as their model shows very bright orange cone-like structures. It is always a pleasure to see prehistoric plants represented in a model range. This Collecta Cycad prehistoric tree is very detailed and the design team at Collecta have clearly taken care to ensure that their model is botanically accurate. This replica will prove popular with dinosaur fans and model makers alike. The Cycad replica being ideal for use when creating authentic and realistic prehistoric scenes. There are now at least four sets of frog spawn in the office pond, less than was laid this time last year and most certainly, we have not seen as many frogs in the pond as we have on previous spawnings. The current cold weather does not seem to have disturbed the amphibians too much, day temperatures in this part of England have not exceeded two degrees Celsius and in the easterly wind there has been a considerable chill factor giving the feeling of an air temperature around minus four degrees Celsius throughout the morning and into this afternoon. Team members from Everything Dinosaur have been inspecting the pond at regular intervals to check on the progress of the frogs – Common Frogs (Rana temporaria), we should not really be surprised that these small creatures are able to tolerate and even breed in these chilly temperatures as this species of frog has a widespread distribution and can be found much further north in Europe. However, there has not been the mass spawning activity that we have seen in recent years. This could be down to a number of reasons, it could be because fewer adult frogs survived the winter and into the spring (if that is what you can it at the moment), to breed, or perhaps there have been less females about and the actual spawning season is likely to be prolonged. With a thin layer of ice on the pond this morning, staff were concerned that some of the freshly laid spawn in the shallows may be frozen and the eggs killed. We do not normally interfere but on this occasion it was decided to gently relocate the spawn to a slightly deeper area so that it could sink a little and thus avoid becoming exposed to too much of the ice. We shall monitor the pond and see if the current cold weather and subsequent cold water temperature delays the hatching of the spawn. A team of scientists based in the eastern part of the United States have published details of a paper that suggests that the extraterrestrial object that struck the Earth and marked the end of the dinosaurs may have been a comet. The New Hampshire based research team outlined their theory at the forty-fourth Lunar and Planetary Science Conference which was being held in Texas. It was father and son team Luis and Walter Alvarez and their study of the iridium-rich clay layer that marked the Cretaceous/Tertiary geological boundary across so many parts of the world, that first led to the theory that there had been a meteorite or asteroid object collision that had led to the deposition of iridium – a rare Earth element. Bang Goes the Theory – Extraterrestrial Impact Asteroid/Meteor or Comet? It was the discovery of the almost 190 kilometre wide Chicxulub crater in the Yucatan peninsula of Mexico that provided the “smoking gun” evidence that there had been an extraterrestrial impact some 65 million years ago that led to the demise of the Dinosauria and around seventy percent of all terrestrial life. The theory that such a catastrophic event might have been a causal factor in the mass extinction that followed has now been largely accepted by the majority of the scientific community. The actual date of the impact has even been calculated to around 66 million years ago, plus or minus either way a few thousands of years for margin of error. However, this new paper proposes that a smaller, faster travelling comet collided with our planet and the culprit was not a larger, slower moving asteroid or meteorite. The New Hampshire team (from Dartmouth College), studied the sediments and rock strata at the Yucatan site and concluded that the crater might have been caused by the impact of a much smaller object, but one that was travelling at immense speed. The smaller mass of the colliding object would have reduced the kinetic energy released but the devastation caused could have been amplified by the much greater speed that a body like a comet would be travelling compared to a rocky meteorite or asteroid. In an analysis of a second rare Earth element deposited – osmium the team were able to hypothesise that the impact object deposited much less debris than previously thought. The research team also concluded that the widely reported higher levels of iridium had been previously overstated. This data was then examined in conjunction with the known geo-physical nature of the Chicxulub impact crater and the team deduced that to deposit on Earth that much iridium and osmium a meteor or asteroid of over five kilometres wide would be needed, but if a rocky object of that size smacked into the geology of the Gulf of Mexico a much larger crater would have resulted. For a smaller object to have created the Chicxulub crater on impact it would have had to have had a greater terminal velocity and the research team point to a long-period comet as being a more likely candidate for the harbinger of dinosaur doom. Long period comets are believed to be remnants left over from the formation of our solar system. They consist of rocks, dust and ice and they orbit the sun, often in very eccentric trajectories, with some comets taking millions of years to complete one circuit. Other comets such as the famous Halley’s comet are known as a short-period comets – having an orbit of less than 200 years. Other scientists challenge the comet impact idea, suggesting that a lot of debris may have been ejected up into and beyond our atmosphere. If a lot of the impact object material was ejected into space and left our atmosphere then the evidence tips in favour of a larger rocky object such as an asteroid. Whatever it was, the devastation caused was certainly terrific with earthquakes, fire storms, enormous tidal waves and acid rain. It is likely that much of the light and heat from the sun was obscured by dust in the atmosphere, shrouding the Earth in what has been termed a “nuclear winter”. Dinosaurs, marine reptiles, the last of the Pterosaurs along with many types of invertebrate, plants and marine plankton became extinct. Flowering plants including the hardwood trees, along with mammals also suffered but it was from the end of the Age of Reptiles that flowering plants and mammals rapidly diversified becoming the dominant and most prominent floras and faunas in most ecosystems today. Team members at Everything Dinosaur continue to be big fans of the dinosaurs and other prehistoric animal models that feature in Collecta’s “prehistoric life” model range. However, every once in a while we can be caught out by subtle changes that we miss, or in all honesty, we have forgotten about. Take for example, the Oviraptor dinosaur model that is one of the replicas in that company’s not-to-scale prehistoric animal model series. The images on the Everything Dinosaur website, were out of date and we had not noticed. Oviraptor with nothing to stand on. 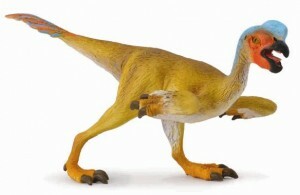 There are over one hundred different prehistoric animal models in the Collecta series to collect, everything from Achelousaurus to Wuerhosaurus and the Oviraptor replica was first introduced in 2010. Like many long-tailed, thin-legged dinosaurs, creating a stable model of this biped proved difficult. It had been developed as a free-standing sculpt without a base. However, the base was added before mass production as the model proved very difficult to balance on its finely crafted toes. That’s what having a digitgrade stance can do for you. The base was added after photos were taken for the company’s 2010 product catalogue and Everything Dinosaur received a set of original photos of the intended model in early 2010 before the base plate had been added. The fact that this model now comes with a base was pointed out to us by a keen-eyed customer, so we have made it our business to ensure that this model is properly represented on the Everything Dinosaur website. Securing a stable future for Oviraptor. The base plate has a lovely texture and it looks like this little dinosaur is walking over sand, quite appropriate really as fossil material ascribed to the Oviraptor genus has been found in rock strata that indicate seasonally arid habitats. One thing that is for sure, anyone who says that we don’t listen to our customers, we can only say that such comments are “baseless”.